Netherlands, possibly Delft, ca. 1475-1500. 16th-century calf, later gilt-tooled spine inscribed: Get den van onse liev vrouw. 127 leaves (1 column, 17 lines), bound : vellum, ill. ; 182 x 127 mm. Dealer's catalogue description, lot 428, pasted onto end pastedown; E. Clark Stillman Collection; Bequest of E. Clark Stillman, 1995. Ms. book of hours, use of the Augustinian Canons of the Windesheim Chapter; written and illuminated in the Netherlands, possibly Delft, 1475-1500. 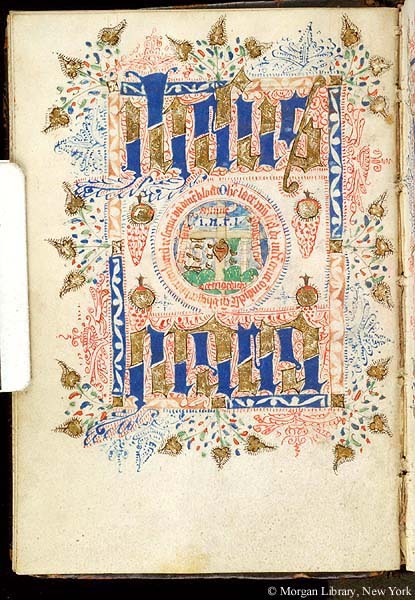 Decoration: 3 full-page non-figurative illuminated compositions with names of Christ and the Virgin; 3 large illuminated initials; 3 text pages with full penwork borders. Watermarks: on paper flyleaves, similar to Heawood nos. 3696-3697, 3709-3711, dated England/Scotland, 18th century; same watermark as for MS S.4.